Revered President Maharaj is keeping well at Belur Math. Swami Vagishananda ji is keeping well at Cossipore centre. Swami Gautamananda ji is scheduled to return to Chennai on 4 October after his tour of UAE, Zambia and South Africa. He will be visiting Hyderabad and Belur Math from 10 to 14 October, and Belur Math again from 24 October to 5 November. He is in good health. Swami Prabhananda ji is scheduled to return to Belur Math on 7 October after his visit to Baghbazar centre. He is keeping well. Swami Shivamayananda ji will return to Kankurgachhi on 12 October after his tour of some places in Assam and Arunachal Pradesh. He is in good health. Swami Suhitananda ji is scheduled to visit Balaram Mandir and Kathamrita Bhavan from 5 to 10 October. He is in good health. A sub-centre of Ramakrishna Mission, directly under the supervision of the Headquarters, has been started at Shyamsayer in Bardhaman. Phone Numbers: Guwahati centre has discontinued its telephone connection: 2134281. It has two new mobile telephone connections: 95314 34681 and 95314 34682. Manasadwip centre has discontinued all its previous telephone connections. It has two new mobile telephone connections: 95476 66334 and 86375 33404. Websites: Malda centre has launched a website with the address <www.rkmmalda.org>. On 7 September, the Governor of Illinois State, USA, issued a proclamation recognizing 11 September 2018 as Swami Vivekananda Day in the State of Illinois. The Government of West Bengal observed 11 September as Sampriti Divas, and the week following 11 September as Sampriti Saptah. On the initiative of Rajkot centre, the Government of Gujarat issued a circular to all schools in Gujarat directing them to arrange for reading out in the assemblies of their schools on 11 September the text of Swami Vivekananda’s inaugural speech at the World’s Parliament of Religions held in Chicago in 1893. Delhi centre conducted an interfaith meet on 11 September in which Sri Pranab Mukherjee, former President of India, was the chief guest. The following centres also commemorated the occasion with various programmes such as processions, public meetings, interfaith meetings and cultural competitions in September. Aalo, Advaita Ashrama (Kolkata), Agartala, Allahabad, Antpur, Asansol, Aurangabad, Bagda, Baghbazar, Balaram Mandir, Bamunmura, Bankura, Baranagar Math, Baranagar Mission, Barasat, Bardhaman, Barisha, Belagavi, Belgharia, Bengaluru, Bhopal, Chandigarh, Chandipur, Chapra, Chengalpattu, Chennai Mission Ashrama, Chennai Sarada Vidyalaya, Chennai Students’ Home, Coimbatore Math, Contai, Cooch Behar, Cossipore, Cuttack, Davanagere, Dehradun, Deoghar, Dibrugarh, Gadadhar Ashrama, Garbeta, Goa, Gol Park, Gourhati, Gurap, Halasuru, Hatamuniguda, Hyderabad, Indore, Jaipur, Jalpaiguri, Jammu, Jamshedpur, Jamtara, Jayrambati, Kadapa, Kanchipuram, Kankurgachhi, Kanpur, Karimganj, Katihar, Kayamkulam, Khetri, Kochi, Kozhikode, Lalgarh, Limbdi, Lucknow, Lumdung, Madurai, Malda, Malliankaranai, Manasadwip, Mangaluru,Medinipur, Mekhliganj, Mumbai, Muzaffarpur, Mysuru, Nagpur, Narainpur, Narendrapur, Narottam Nagar, Nattarampalli, Ooty, Pala, Patna, Ponnampet, Porbandar, Pune, Puri Math, Puri Mission, Purulia, Rahara, Raipur, Rajamahendravaram, Rajkot and its sub-centre in Ahmedabad, Ramanathapuram, Ramharipur, Ranchi Morabadi, Salem, Saradapitha, Sargachhi, Seva Pratishthan, Shillong, Shimla, Shyamla Tal, Sikra-Kulingram, Silchar, Srinagar, Swamiji’s Ancestral House, Taki, Tamluk, Thrissur, Tirupati, Tiruvalla, Vadodara, Varanasi Advaita Ashrama, Varanasi Home of Service, Vijayawada, Visakhapatnam and Vrindaban. 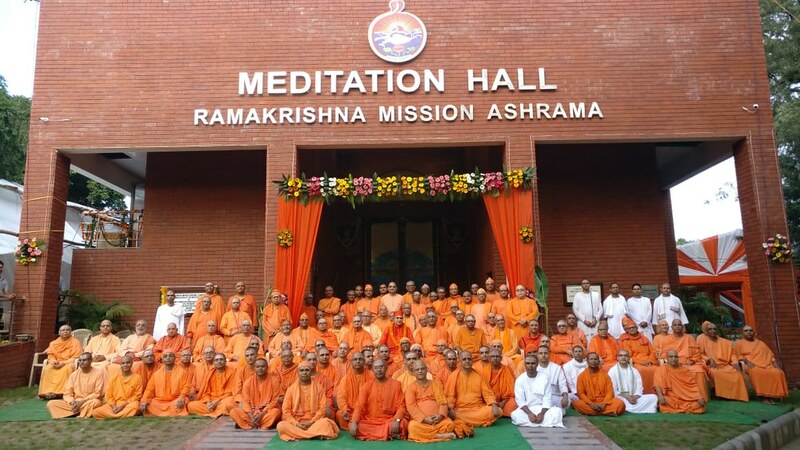 Bangladesh: Comilla & Dhaka, Holland, Nepal, Singapore, South Africa: Durban & its sub-centres, Sri Lanka, USA: Berkeley & New York Ramakrishna-Vivekananda Center. Rahara Boys’ Home celebrated its platinum jubilee on 1 September with special worship, procession and cultural programmes. About 15,000 students and devotees attended the programme. 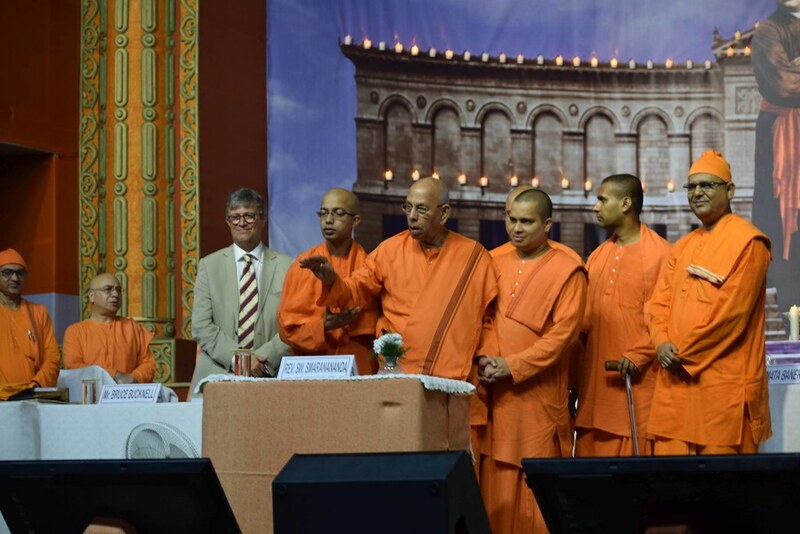 Revered President Maharaj, Swami Vagishanandaji, Swami Shivamayanandaji, the General Secretary and others spoke in the public meeting held on that day. 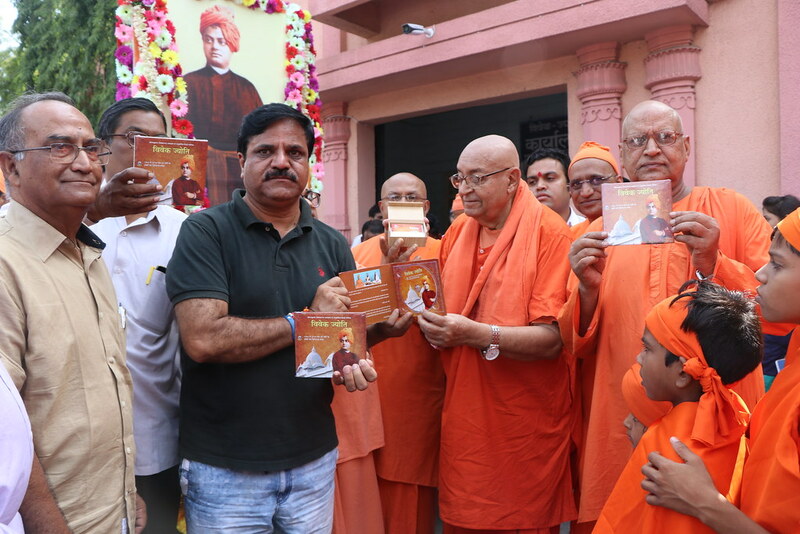 On 14 September, Dr Partha Chatterjee, Minister of Higher Education, Government of West Bengal, inaugurated the newly built extension to the Vivekananda Centenary College building on the centre’s campus, and the General Secretary unveiled a bronze statue of Swamiji in the new building. Swami Vagishananda ji unveiled a fibreglass statue of Swamiji at Purulia Vidyapith on 19 September. The headmistress of the Higher Secondary School (Main) of Chennai Mission Ashrama received Dr Radhakrishnan Award on 5 September, the Teachers’ Day, from the Department of School Education, Government of Tamil Nadu, for her contribution to the field of education. 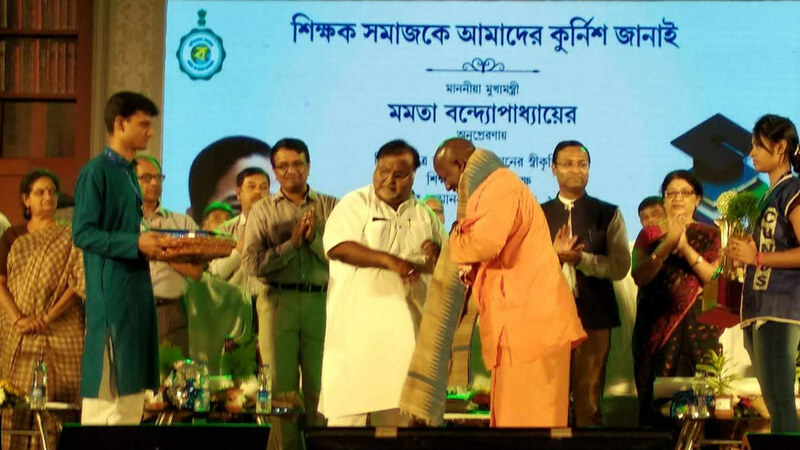 The School Education Department, Government of West Bengal, presented the Best School Award to Purulia Vidyapith in a function held in Kolkata on 5 September. The award consisted of a memento, a certificate and a sum of 50,000 rupees. 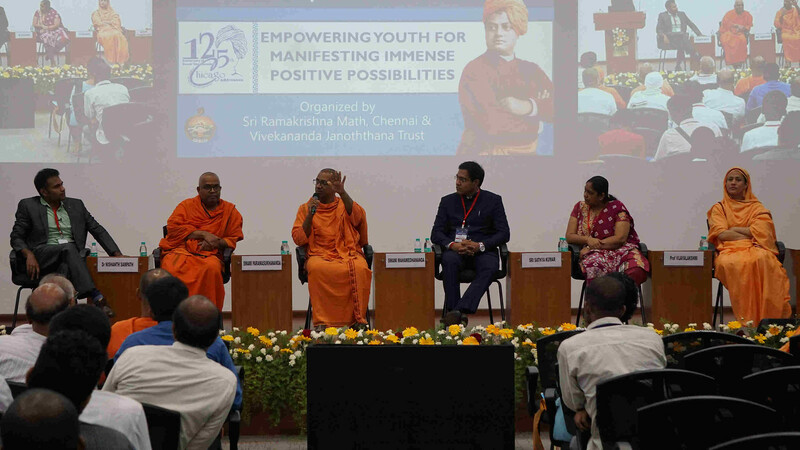 ISOL (Integrating Spirituality and Organizational Leadership) Global Foundation presented the ‘Sri Ramakrishna Award for Universal Values’ to Antpur Math on 11 September at a programme held in Chicago, USA. The Industrial Training Institute (ITI) of Coimbatore Mission Vidyalaya obtained eighth position in the national level grading of nearly 5000 private ITIs by the Ministry of Skill Development and Entrepreneurship, Government of India. Two students of Deoghar Vidyapith secured first and second positions in the essay competition, followed by oral presentation, conducted by S N Bose National Centre for Basic Sciences, Kolkata, in September 2018. Apart from them, two other students of the Vidyapith also secured scholarships from the National Council of Educational Research and Training (NCERT) by clearing the National Talent Search Examination 2018. A class-12 student of Narainpur centre was selected for the under-18 national football team and played in the Asian Schools Football Championship held in Agra from 20 to 30 September. 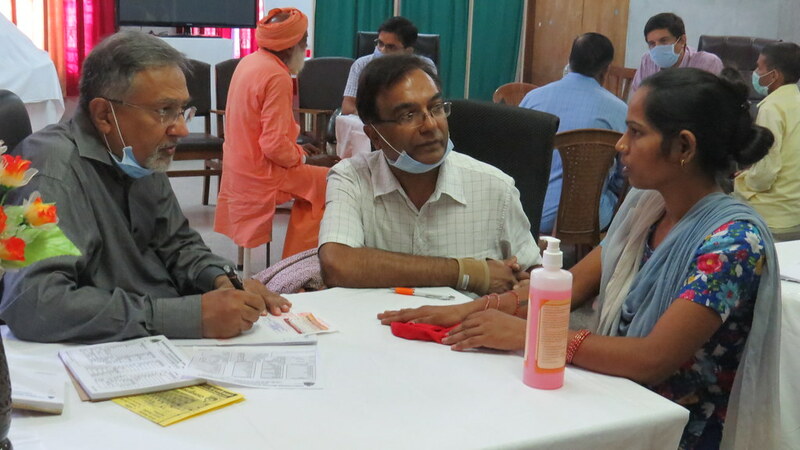 Guwahati centre conducted a free medical camp at Palahguri village in Morigaon district of Assam on 23 September in which 360 patients were treated. The new vocational training centre of Hatamuniguda centre was inaugurated on 3 September. Jhargram centre received a certificate from Vidyasagar College, Kolkata, and Association of Biomedical Sciences, Kolkata, on 29 September in recognition of its performance in school education. The thirteenth convocation of RKMVERI (our deemed university) for the faculties of Disability Management & Special Education, General & Adapted Physical Education and Yoga, Computer Science Applications & Research, and Agricultural Education & Research was held at the university’s faculty centre in Coimbatore Mission Vidyalaya on 12 September. In all, 187 successful candidates of the above four faculties were awarded certificates and degrees. 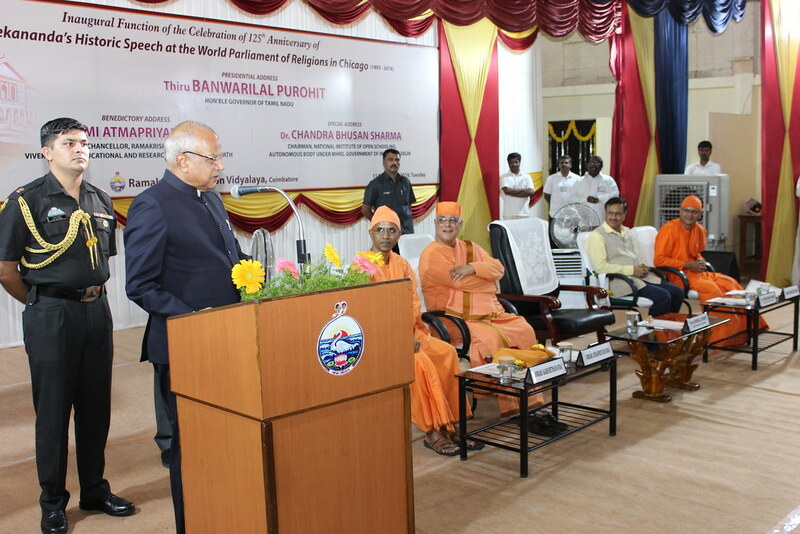 Swami Gautamanandaji presided over the ceremony and Dr Chandra Bhushan Sharma, Chairperson, National Institute of Open Schooling (NIOS), New Delhi, delivered the convocation address. Saradapitha centre launched a year-long cancer awareness and prevention programme on 14 September by holding a procession and a seminar. About 100 people participated in the procession, and 300 people, including many doctors, teachers, students and others, attended the seminar. Delhi centre conducted 19 values education workshops in different places all over India between 10 and 27 September; they were attended by 1159 teachers in all. Rajkot centre held 12 values education programmes in the centre as well as in different schools and colleges between 7 and 19 September. The programmes were attended by 2925 students. Salem Ashrama conducted six values education programmes at six colleges in Salem district from 3 to 26 September which were attended by 1130 students in all.